My favourite challenges are sketch challenges! I'm pretty sure it's because I have such a difficult time with layouts and sketch challenges do all the hard work for me. Today I'd like to thank Sketch Saturday for their Challenge # 57. This is a 5" square card, but methinks it should have been a 6" square. By the time I got through adding embellishments etc., it was feeling a bit cramped to me. Doesn't matter, I still like the whimsical feel of the card. It makes me think of sun-filled days at the beach, sand-in-the-toes walks by the ocean and being lucky enough to see a pod of whales playing just for the fun of it! Friday Sketchers and a Happy Mom! I have four grown children ranging in age from 25 to 37. Just recently, my daughter, Tiffany, took possession of her new condo. All of my children are now homeowners! WOO-HOO! I feel quite a sense of accomplishment for each of them. Not only has Tiffany climbed onto the property ladder, but my daughter, Kirsten (the one who lives in London, UK), moved into a larger home just this past Wednesday. They have moved into a very spacious four-bedroom, semi-detached house in South Woodford. I was fortunate enough to have had a tour when I visited them back in April/May and I'm sure the grandsons are running around the house with glee. They will have lots of room to run now. 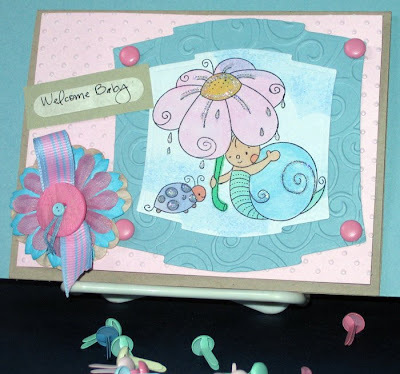 So, what does a proud mama do; makes cards to welcome them to their new homes, of course. This card will be going to Kirsten, John, Owen & James. This card is also my entry for the Friday Sketchers challenge # 58. It's a 6" square card and the base is Prism c/s in a colour very like Bashful Blue. 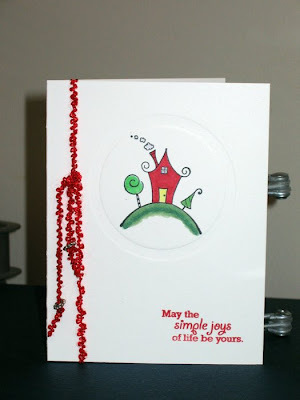 The DP is called Houses in the Park by Heidi Grace Designs and I thought it totally appropriate. 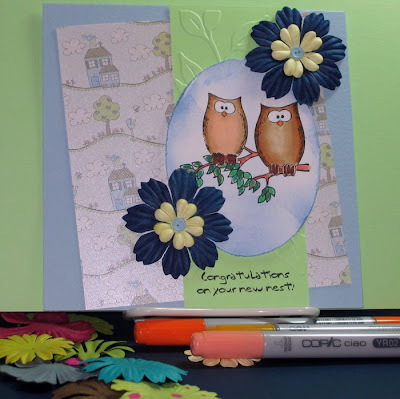 I used the CB on the Gable Green strip of c/s using the embossing folder with the tree branches. If you don't recognize the image and sentiment, they are from Gina K. Designs. 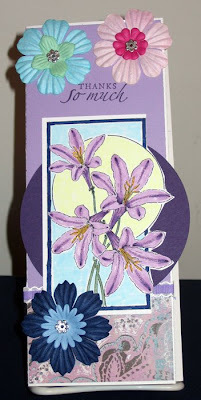 I used Copics to colour the image and added some Prima flowers with little button brads for the centre. My DH thinks these are the best owls I've ever coloured. Thanks, honey! Next up is the card I made and gave to Tiffany last week. This was a very clean and simple card. 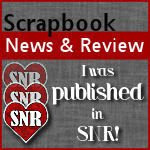 I used the Pure Luxury 120 lb c/s from Gina K. Designs and followed the technique for embossing which was on Stamp TV a week or so ago. If you haven't checked out Stamp TV yet, please, do it soon. You won't be sorry! The image on this card is from TAC. I coloured it with Copics and after it was done I thought it looked like a Christmas card, but I like it anyway. I added a little red fibre with some metal do-dads (very technical name, I know) on the ends and it was ready to present to Tiffany. Well, this is the end of my post and I want to thank Friday Sketchers for giving us such a terrific sketch to work with this week. I've added it to my Google Reader so I'll be sure to get the challenges as they happen. I just love the colours for this week's Color Throwdown # 48. Cathy chose a fantastic combo of colours and, thankfully, I had them all. Here's my card. I'm in love with this Rachelle Ann Miller stamp and these colours are perfect for this image called "Giving Shelter". I used Kraft for the base. 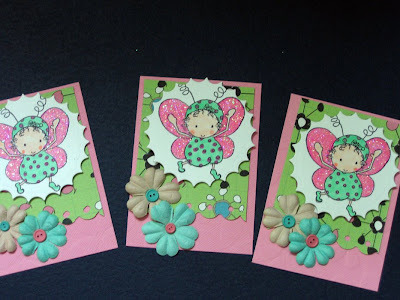 The first layer is Pink Pirouette which has been run through the Cuttlebug using the Swiss Dots embossing folder. 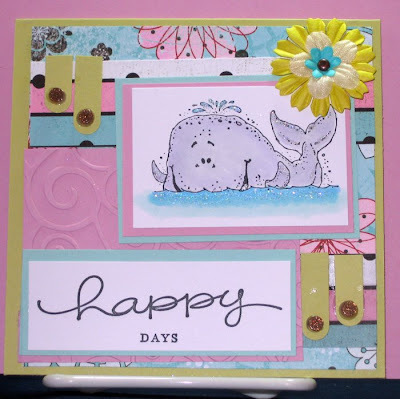 Next, I embossed and cut two pieces, one in Baja Breeze and the smaller piece on the DP with clouds. I used the Nestabilities Labels 2 for these bits. I stamped the image onto the clouds paper and coloured it with Copics. Here's my tip for the day: keep a scrap of the paper your image is on to test out the Copics, especially if the paper is very thin because the colours will change dramatically as they dry. I mounted the image onto the Baja Breeze c/s and attached it to the Pink Pirouette piece with brads from Basic Grey "Two Scoops" line. The sentiment was computer-generated using the CK Becky font. The flowers were from my stash and I used a button and some ribbon for the centre. All in all, I'm pleased with the outcome and I hope you like it too! Thanks Color Throwdown team for another great combo! If you do, just go on over to SCS and sign up on the Canadian Group 1 list. I'll make it even easier for you; here's the link. This is my first swap on SCS, so I hope it's not cancelled. Oh well, if it is, then I'll just turn these little Love Bugs into birthday cards or thinking of you cards or some kind of card. That's all for today, just a short and sweet little post. This card is long overdue, but as the saying goes, "better late than never"! When I was in England in late April/early May, I had the pleasure of spending a day with Alma. Now this lady is a feisty, tiny, don't-mess-with-me Irish gal. I think she's great and will be forever greatful to her for introducing my lovely daughter, Kirsten, to her husband, John. I can relax in the knowledge that my daughter has found her true love. However, I digress. I'm thanking Alma because she took a day off work to squire me around the Victoria and Albert Museum. We saw the Hats Through the Ages Exhibit and the Fashions of Yesteryear (my own name because I can't remember the proper one). We had a lovely lunch and coffee during the day and just had a super time. That's why I made this card, to say thanks. The only thing I know for sure about this card is that the stamp I used was from Pickly Pear and I used Copics to colour. All the rest of the card was made from papers I had in my scraps drawer. The flowers and little centres in the middle of the flowers, along with the ribbon, were sent to me in a bag of goodies from Debbie. I won the draw on her blog for the Sketch Saturday birthday celebration. Thank you, Debbie, the bag of goodies was extremely generous and will be put to good use. This picture was taken at TGI Friday's in London, England during my recent visit. It was the same day we went on the London Eye. It's hard to believe that it's three years since my first grandchild was born. All too soon he'll be ready for school. I hope to visit Owen for his fourth birthday next year. Have to spread it around, you know, to be a fair grandma. Or, maybe I could just have an extra long visit and be there for James' and Owen's birthdays. There only six weeks between them. That would be a delightful trip for me. I can always dream. Anyway, just wanted to say "Happy Birthday" to a very special little boy. I hope you have a wonderful birthday, Owen.